¶ 1 Leave a comment on paragraph 1 0 Another stamp printed in 1933 came as a suggestion from President Roosevelt that supported an expedition to Antarctica led by Admiral Richard E. Byrd. Designed for philatelic purposes, the Philatelic Agency (PA) sold the stamp. 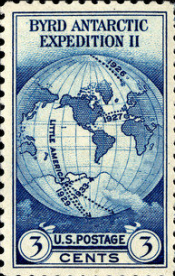 ¶ 3 Leave a comment on paragraph 3 0 If collectors wanted their stamps to be canceled at the Little America post office by the expedition crew, they sent a self-addressed stamped envelope with a postal mail order for fifty-three cents to the expedition’s headquarters in Norfolk, Virginia, or to the PA. 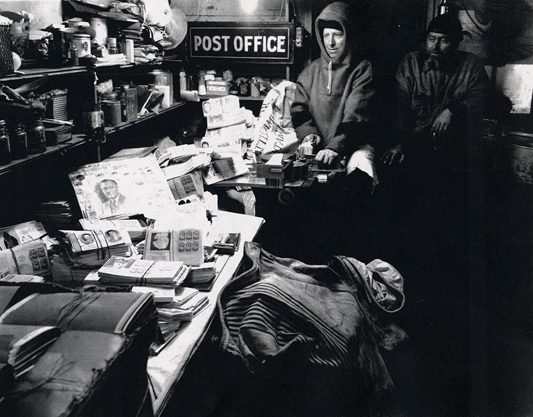 Covers were gathered and sent down to the “most southerly” post office. Byrd served as a naval (reservist) officer and scientist who had explored regions near the North and South Poles, during his career. He also was a close friend of FDR’s who supported this expedition. Byrd secured private financing for his polar journeys, and but the expeditions were expensive. While FDR did not divert federal dollars towards Byrd’s second Antarctic exploration (1933-34), FDR did facilitate a path allowing the proceeds from the limited issue commemorative stamp to go towards the expedition expenses. ¶ 6 Leave a comment on paragraph 6 0 Prior to Byrd’s expedition, another pioneer relied on philatelic funding for her travels. 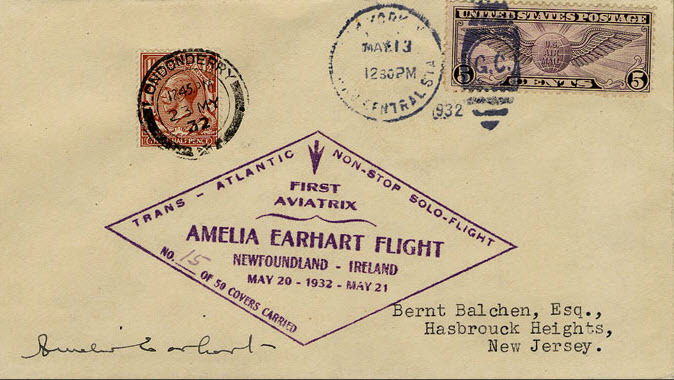 Amelia Earhart also carried mail with her on her first transatlantic flight in May 1932, but her flight was not authorized by the USPOD. Instead, philatelists paid her to postmark each of 50 letters in Newfoundland and after landing in Ireland, and she numbered and autographed each cover. News spread through philatelic circles and Earhart carried mail with her on additional flights. She also saved and exhibited examples of her stamped envelopes, or covers, at philatelic exhibitions. On her final, fatal, flight she carried approximately $25,000 in souvenir envelopes .2 Sales of the Earhart covers and the Byrd stamp contributed to the expenses of both Earhart’s and Byrd’s expeditions. Earhart appealed directly to philatelists for her support; Byrd appealed to his friend the president and was officially supported by the federal government. ¶ 9 Leave a comment on paragraph 9 0 FDR continued to capitalize on the Department’s ability to promote federal programs in the 1930s by encouraging the printing of a series highlight the growing network of national parks. Declaring 1934 as the National Park Year, Secretary of the Interior Harold Ickes worked closely with PMG Farley to create a 10-stamp series featuring picturesque scenery from ten parks. Issued in rapid succession primarily during summer months, the series was designed to encourage domestic tourism.5 A collector could buy all ten and assemble them as if they had traveled across the US visiting those natural wonders. ¶ 11 Leave a comment on paragraph 11 0 The National Parks Year also coincided with the expansion of the National Park Service to include battlefields and historic sites. 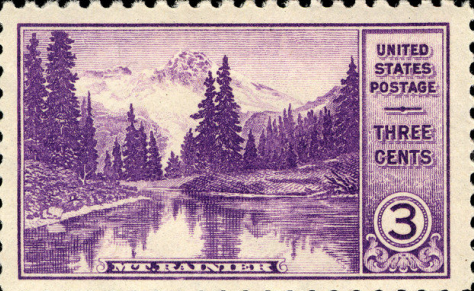 None of the new sites appeared in this series, but the stamps reinvigorated interest in the federally-managed park system. Without naming a New Deal program, this series also subtly promoted the work of the newly-created Civilian Conservation Corps. Beginning in 1933, the CCC employed hundreds of thousands of young men who built infrastructure at national parks and forests across the US. Tourists, collectors, or relatives of CCC workers might decide to buy one or more stamps in the National Park series. ¶ 12 Leave a comment on paragraph 12 0 Once again, this limited issue series did not represent a historical narrative, but rather, promoted contemporary government initiatives. Roosevelt’s administration showed its acumen for marketing federal programs by piggy-backing on the success of Post Office’s commemorative stamp program. Stamp sales increased and the receipts from the Philatelic Agency during fiscal year 1935 were the highest to date. This growth was seen by the USPOD as “further evidence of the increasing attention that is being directed to stamp collecting.”6 Popular participation in and media attention of stamp collection was beginning to peak nationwide. ¶ 13 Leave a comment on paragraph 13 0 Federal efforts to unite Americans during an economic depression included stamps in their portfolio that showcased the beauty of National Parks, the common determination of citizens, and the achievements of explorers enduring extreme condition for scientific research. Another Rooseveltian effort to promote feelings of nationalism came with a series of stamps honoring military heroes. The announcement of this series surfaced regional, gender, and racial tensions, while also questioning who qualified to represent national character on US commemoratives.